Garden of Life Raw Protein gives you everything you want and more in a protein supplement, a complete source of protein from 13 RAW and organic sprouts. 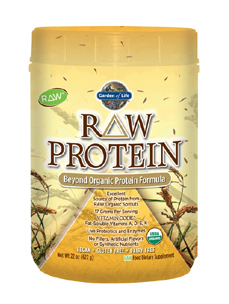 RAW protein from Garden of Life is a RAW, vegan, plant-based, certified organic protein formula. 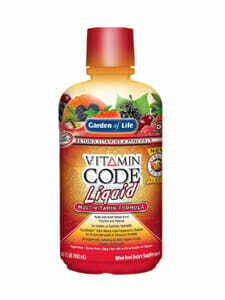 Purchasing this product today earns you 43 DR Reward Points! RAW Protein from Garden of Life is a RAW, vegan, plant-based, certified organic protein formula. A complete source of protein from 13 RAW and organic sprouts, RAW Protein gives you everything you want – and more – in a protein supplement, without chemical additives, preservatives, sweeteners or fillers. RAW Protein contains Vitamin Code® fat-soluble vitamins and supports digestive health and function with live protein-digesting enzymes and powerful probiotics. * RAW Food-Created Nutrients are individually created through dual-organism cultivation which typically allows for the natural creation of known and yet to be discovered Code Factors such as Live Probiotics, Bioactive Glycoproteins, Bioactive Lipoproteins, Bioactive Enzymes, Glucomannan, SOD, Glutathione, Beta-glucans, Lipoic Acid, Essential Trace Minerals, Glutamine, Polysaccharides and CoQ10.